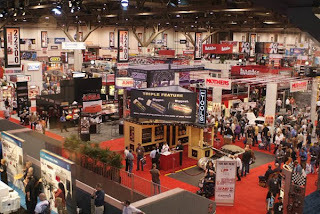 This past Thursday I returned from my first and one of the biggest trade shows: SEMA. SEMA, otherwise known as the Specialty Equipment Manufacturers Association, is held each year in Las Vegas. As the biggest show for the auto aftermarket industry, I have helped clients prepare but have never been able to attend. Getting ready for the show was a bit stressful as I wasn’t sure how to pack or what to expect. I’m here to pass on my wisdom (little as it may be), so you can be a bit more prepared for your first trade show. I thought I was covered by bringing a large purse that could hold my laptop. I was wrong. When you’re at a trade show you’ll likely need to carry your laptop, laptop charger, cell and cell charger, briefing binder, print outs, etc. No matter how big the purse, you’ll want to have something else with you, if for no other reason than to save your shoulders. We were told to wear black shoes in our booth. I brought a pair of black flats that I survived in, but when you’re standing for eight or more hours a day tennis shoes are your safest bet. Don’t worry if they don’t go the best with your outfit. Everyone who’s been to a trade show knows the drill, and they won’t think you’re underdressed. Perhaps part of it was Vegas, but those huge convention halls are really dry. Add that to the fact that you’ll be doing a lot more talking than you’re used to, and you’re bound to get a bit horse. You probably won’t be allowed to eat and drink in the booth, but having a bottle of water stashed in your backpack will allow you to sneak a drink every so often. Trust me, it helps. There are a lot of logistics to keep track of while you’re on the floor. Chances are you’ll be using your phone. A lot. If you have an iPhone like me, you know how fast the battery drains. Always bring your charger. There will most likely be somewhere in the booth where you can plug-in for a couple minutes. If you can’t find an outlet, you can always use your laptop. Originally I was going to fly in the afternoon before the show started. I’m really glad we decided to fly in a night earlier. There are always last minute adjustments and fires to put out, and it’s better to have extra time as opposed to running around like crazy the first day of the show. Ship everything to the business center and keep your tracking numbers! Not only will this save you tons of money in bag fees at the airport, but it makes things so much easier! If you’re staying at a hotel that deals with conventions they will be well equipped to handle last minute requests and packages. Just remember to keep your tracking numbers in case something goes wrong. It will also help you check off your list, to make sure you’ve received everything. This is something I could have done a better job of. There’s nothing worse than running to the business center at 8 a.m. to e-mail and print off 50 copies of your news release 30 minutes before your press conference. Save yourself the headache, and try to do as much of that as possible at the office. Remember, you can always ship it to the hotel. One of the hardest parts was figuring out what to pack. My advice: pack clothing that you can mix and match. You need to be able to go from work to client dinner to drinks pretty seamlessly. When in doubt, a lot of black pieces are always a safe bet. And, of course, it’s always better to be overdressed than underdressed. You’re in Vegas, baby, or some other fun city. You should try to go out and enjoy it. Chances are you’ll probably be taking clients out at least one night. Have fun, but keep it professional and don’t overdo it with drinks. Some people will tell you not to drink at all. I think that’s silly. By now you’re a grown up. You know your limits and when you’re feeling tipsy. Pace yourself and stop drinking if you think you’re getting to the breaking point. There’s no shame in ordering a diet Coke. It’s OK for a client to show up hung over the next day. It’s not OK for you. From my experience, there’s one thing missing from trade shows. Sleep. You have to wake up early in the morning, stay on your feet all day and often don’t get to bed until late. So, if you have an opportunity to go to bed at a reasonable hour, take it. You’ll thank yourself as the week wears on. That’s it. Good luck! And happy trade show going.